Hey nice pics guys them are some big dogs!!! Stoneam2006, Welcome to the forum! Everyone is right! This is one of if not the best forum around. Everyone is very helpful.... & knowledgeable. Those restraints are called snares. They are not legal here for good reasons. One reason is they can and will kill deer. Another reason is they will also kill my dog. If I ever find my dog in one then a pack of coyotes is the last thing you need to worry about. I've released my dogs from footholds a bunch of times. I just laugh and tell them that what they get for sticking there nose where it don't belong. But if they hit a snare full speed and it locks around there neck its over fast. I support trapping and will set traps myself. None would ever be a snare or a conibear on dry land. Stupid and irresponsible. Another thing is like was said. They cost pennies. So they get misplaced and left behind in the woods and restrain animals to there death. Not like a $20+ victor that you would look for. Your cheap snare gets forgot and left right where you set it. 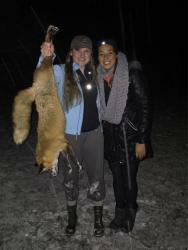 Don't set snares and do not think of it ever in NY. A snare might have its place. But not as a main tool. You should try catching them in footholds and maybe use a snare in a controlled situation with a few yotes and areas. Not a main tool cause its cheap and light weight. That's just lazy. Hope it works out for you either way. Pa is a long way for my dog to run....but if it does you better hope that snare don't find its way around its neck. Are you saying you run your dog without regard to that of private property? Im sorry and I mean no disrespect but you are misinformed on this topic. Snares very very rarely kill on catch. Domestic animals just sit there as they think they are on a leash and I have never read or heard of snares killing a dog. You are 100 percent right about Conis on land. But foot holds average less than 10 dollars a piece not 20....and are not bc people are lazy but more that they catch trap shy animals very effectively. Also there is times snares and a better option. Cable restraints are just that, restraints. They are not lethal if used properly which is why states are starting to allow them. If the captured animal is not in an entanglement situation which is mandatory in PA. the lock mechanism will let off pressure no different than a choke color for a dog, some locks do not which is why you cant use that kind. As far as big game ( deer) or livestock are concerned , these restraints now have whats called a break-away device , again, mandatory, which there are several types, most common is an " s " hook specifically made for a certain pound rating , roughly 300lbs or so which can withstand a captured coyote, but will break open when larger animals pull to get free such as deer. As in anything ever, nothing is perfect , we refer to those things as accidents. As far as cable restraints being cheaper, yes they are, but being left behind by sportsmen and woman thats more of an ethics discussion which is a whole topic by itself. A lot of testing , time and money and effort went into allowing cable restaints being legal to use, and probably the number one reason in my opinion is dogs, trappers have dogs themselves , why would they want to kill them , and dead dogs is a huge piece of propaganda for animal rights people to use against all of us. Congrats to you wishinfishin, that was perfectly said and to the point with all the legalities incorporated into the post. Last year this thread went from start to finish without one problem, which really floored me. Now the third page of this thread we have 1 hick up already from a newbee, UUUGGG!!! Wishinfishin, Thank you! You got to say what I was going to say before I said it. To the other gentleman complaining about restraints. First of all Wishinfishin is exactly correct. These are not snares. These are cable restraints. Snares tighten up till they strangle the animal. Restraints do not. There is a built in stop lock that will not allow strangulation on dogs & other smaller animals. I've been running restraints since they became legal in 2005 in Pa & I do everything I can to make sure incidental catches are minimized. I am not 1 to set my restraints in areas known to be hunt hard for small game. There's just to much of a chance of catching someone's pup. Even though, I have seen a beagle in a restraint. She just sat there (like on a leash) till my buddy (his dog) walked over & released her. I myself make sure when I'm done setting a restraint the animal has a 360 degree clear & free circle to roam & I have only had 2 red fox dead upon my arrival. Mainly because they tried to jump thru the restraint instead of walking thru. It caught them on the chest, restricting their air flow. If anything I have had more trouble with "people" stealing my restraints or animals, cutting or destroying my restraints than the other way around. I do very minimal damage to the area I trap. If it weren't for my tracks in the snow you wouldn't even know I was setting restraints in an area. And when I leave it looks the same as it did before I got there, minus the coyotes & fox. And as far as leaving a restraint behind because they are cheap? That's just absurd. Why would I leave a restraint ($2 for the restraint, $1.50 for the ground anchor, $.75 for the quick connect link & my upright wire) behind? As well as a restraint that has my license # attached to it? Yes I have had deer caught in the restraint. Most get out by breaking the S-hook release. I'm not going to lie. When you're setting deer trails & field edges it's going to happen. Yes I have found 3 dead deer in my restraints. They were smaller 1st year deer who weren't strong enough to break the release but too big for the restraints cable stop. Which is a shame. But compared to the numerous yotes I have taken out of circulation in the areas that I trap these areas are better off deer/rabbit/pheasant wise than before. What the other gentleman needs to understand is I'm not trying to hurt his dog. I'm trying to do us both a favor by trying to reduce the population of coyotes & fox so the he can enjoy his preferred sport just as much as I enjoy mine. It's a win win. Sir, please do your homework before spouting out something you obliviously know next to nothing about. I understand your apprehension. Because you're correct. There is a chance of fur damage because of the restraint. But if you check the restraints regularly (I check my traps/restraints every 20-24 hours) you can eliminate most of that from happening. There's a down side to everything I guess. I do use footholds, dog proofs, weasel boxes & am going to try Fisher trapping this year with live havaheart traps. I figured I would give myself every opportunity available in my arsenal to use while trapping. The only trap I have not used often is conibears. That's a whole other side of trapping I've not tried often. I may try some leaning pole sets for Fisher with conibears this year. That's exactly why they do it? Also ease of setting them fast and without perfect places. NYS has very very specific regs on setting them below 4 foot off ground. Box specs are strict to stop pups and other animals from getting in. Once 4 foot up can set how ever you want. I'm going to put in boxes for 3 reasons. 1 it stops the fisher from entering in from the backside and get the bait with out getting caught. 2 should help the few guys out there be able to I'd my traps and hopefully stay away.3 birds of prey from messing with bait. I don't know if you say but earlier this year someone set a Coni on land and killed someone's Dog iirc it was up toward syr somewhere. Can never be to safe when talking kill traps. Just an FYI about using restraints. If you're from New York it's a no go. They're not legal in NY. And if you're from Pa. remember you need to be certified & take a cable restraint class provided by the Game Commission before you can set restraints. Hate to see anyone get into trouble. I totally agree, thanks for the info. I got a story for you guys. 4-5 years ago my brother and I were hunting on this piece of property he had permission from the land owner, but it was a verbal, we didn't even get in the woods yet and a town cop pulled up while we were getting our gear together. He said someone called and said there were hunters in a private property area. My brother explained he was the contractor in the course area and had permission from the owner, he said the deer were doing major damage to the greens. Now this is in January so nobody is golfing, plus it's surrounded by hundreds of acres of woods. We were told to get written permission then we could go hunting, so my brother gets written permission and don't you know the same thing happens but a differant officer, Faron shows his written permission and the officer says have a nice day guys and good luck, and by the way I like deer meat also, we will take care of ya, probably see next Saturday. Here's where it gets scary, my brother was battling cancer at the time so I told him to go out on the surveyors path and I'll go around and make a chase down to you, give me 15 minutes, ok. I gave him time cause he couldn't go like he used to, about 10 minutes into my walk around I heard him scream my name!! All I could think of is he fell and broke something!! I ran as fast as I could to get to him, WTF going on he's standing in a weird position, he's screaming help me!! I get up to him and he has 3 triple hooks in his thighs 1 in his rear end. Here some one was using fishing wire with triple hooks baited with meat hanging from tree branches and he got 3 of them in him, luckily I had my leathermans with me I cut the cable then I cut the hooks out of him. So I cut all I could find down and kept them. On our way out we stopped at the Stroudsburg area police station and handed the cop what we found and told him about the hooks in my brother. I told him he better go to whoever called every time we went on that property, there's a reason he didn't want anyone on there. We found out later that a coyote was found dead hanging on a wire with a triple hook in its throat, the game commission asked if we would show them where we found these hooks. I never heard if anyone was ever caught. But talk about a complete azz hole!! There's no doubt in my mind it was the guy who called the cops but they couldn't prove anything. Now that's what I call an unethical piece of shyt. We returned to the property but walked with caution!! He did this to eradicate the yotes and everything that was a threat to "HIS" deer. PAP, That's crazy! What's to be gained by doing something like that other than killing off the yotes? Stoneam2006 brings up a very good point. All it takes is 1 anti with a camera & it would have been front page news! That's all your brother needed in his condition. What if he was alone? Caught in that mess. God Lord knows when someone else may have happened by & heard his screams considering it was January! We had a problem on a similar line down our way with poaching turkeys. Some piece of crap would (I hope this doesn't give anyone ideas) take heavy duty fishing line (100lb test or better) & put small treble hooks on it with corn on the hooks. The turkey would swallow the corn &....... I swore if I ever found out who was doing it I'd go to the fullest extent to make sure they were arrested. Not sure if they ever found out who was doing it. As fast as it started it stopped.